Drillers’ mad dash to the Eagle Ford has spurred a printing boom, as publishers court new advertisers and audiences — including industry executives, natives of transformed communities and oil workers with little to do in isolated towns. BOERNE — This town does not sit atop South Texas’ Eagle Ford Shale, but inside an air-conditioned advertising agency here, four women produce a newspaper that has infiltrated that dusty drilling country. With headlines like “Concealed Handgun License 101,” “How to Take Care of Your Leather Cowboy Boots” and “Seven Gifts Not to Get Your Special Lady,” The Boom, Rudkin Productions’ year-old newspaper, is aimed at typically male — and typically bored — oilfield workers, who can grab the tabloid in restaurants, gas stations and other businesses throughout the Eagle Ford region. More importantly for the agency, the newspaper, with a circulation above 12,000 and distributed every other month, has drawn steady interest from advertisers hoping to gain a foothold in an emerging market. Rudkin, 46, is not the only publisher trying to capitalize on one of the country’s hottest shale plays. 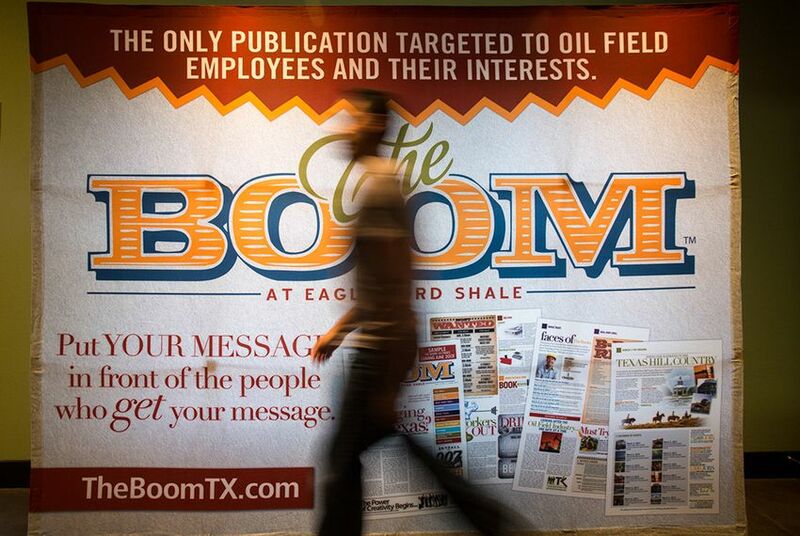 Drillers’ mad dash to the Eagle Ford has spurred something of a printing boom, as publishers court new advertisers and audiences — including industry executives, natives of transformed communities and oil workers with little to do in isolated towns. Along with The Boom, at least three other shale magazines have cropped up since 2013. Though they have different looks and slightly different focuses, each is a direct result of the drilling surge. That growth comes as many print newspapers and magazines elsewhere have slashed staff or shuttered their offices as they struggle to deal with consumers’ shift to online and mobile news sources. During the early days of Eagle Ford drilling, about five years ago, advertisers had few ways to reach across sparsely populated and spread-out communities, and oilfield workers were particularly elusive because many do not have permanent addresses in the region, publishers say. Free shale publications moved in to fill that gap. Some publishers’ motivations are not purely financial. Kym Bolado, who founded the 20,000-circulation Shale Magazine, said she wanted to emphasize the positives of an industry that has pumped big money into economies and important state programs. Bolado, who has a background in mental health and child development, said she saw how state budget cuts years ago harmed those services. “While I don’t think the industry is perfect in every way, we need to recognize the benefits,” she said. The Boom — the brainchild of Rudkin, whose nephew, an oilfield trucker, complained of having little to do when not working — is a hodgepodge of BuzzFeed-style lists and short articles addressing a range of topics. Stories occasionally touch on shale economics, but most cater to more general interests. Its sections give workers tips on managing money (“Payzone”), working out (“Pumped”) and cooking (“Grill Baby Grill”). The newspaper’s creators cull most of its material from websites with permission, but they occasionally hire freelancers and produce some content in-house. “I love it that nobody knows we’re doing it,” Olga Garces, a graphic designer, said of the fact that an all-female team was producing a magazine aimed at men. Garces, 34, a life-long Texan who has friends working in the Eagle Ford and who listens to country music, said she had no trouble keeping The Boom authentic. “It is honky-tonk and Texan, and I feel like I can relate a lot,” she said.